Harbour Quay is an area that was once known as The Crumbles - a shingle beach between Eastbourne and Pevensey Bay. During the early 1920's, two brutal murders took place on the Crumbles. In 1920, Irene Munro was murdered by Jack Alfred Field and William Thomas Gray. Then in 1924, a pregnant woman named Emily Kaye was murdered by Patrick Mahon. According to Coxe, both victims reputedly haunt the area. 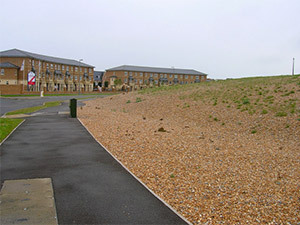 Pictured left is Harbour Quay and a large bank of shingle from when the area used to be known as The Crumbles, courtesy of Simon Carey. Eastbourne is a large town and seaside resort in East Sussex, England. It lies on the south coast of England, 19 miles east of Brighton. Pictured left is the beach at Eastbourne courtesy of Oast House Archive. Licensed under CC BY-SA 3.0 via Wikimedia Commons.